Since the arrival of Srila A.C Bhaktivedanta Swami Prabhupada and the beginnings of the Hare Krsna movement in New York in 1965, many stories have come down to the present generation regarding the struggles and successes of His Divine Grace. Yet little is known to us of the struggles and successes of preaching in the west during the time of and shortly after the manifest pastimes of Srila Bhaktisiddhanta Sarasvati Thakura, a time before most contemporary Vaisnavas were yet to be born. One such inspiring story is that of Adhoksaja Visnu and Srila Bhakti Saranga Goswami Maharaja. Our story begins in 1888 with the appearance of Bhakti Saranga Goswami Maharaja in a renowned brahmana Goswami family of the Nityananda-vamsa lineage (the family of Sri Nityananda Prabhu). His childhood name was Atula-candra Bandyopadhyaya. In 1920, at the age of 32, Goswami Maharaja joined the Gaudiya Matha and soon became an initiated disciple of Srila Bhaktisiddhanta Sarasvati Thakura receiving the name, Aprakrta Dasa. Sometime later Bhaktisiddhanta awarded Aprakrta Dasa the upadhi (title) ‘Bhakti Saranga.’ Henceforth, he was known as Aprakrta Bhakti Saranga Goswami Prabhu, or Aprakrta Prabhu for short. After many years of distinguished service in the Gaudiya Matha, in a second attempt to establish Krishna consciousness in the west (late in 1936), Bhaktisiddhanta sent Aprakrta Bhakti Saranga Goswami Prabhu, a householder at the time, to London for preaching the mission of Sri Krsna Caitanya. Before departing to London, Sarasvati Thakura gave Aprakrta Prabhu the govardhana, salagrama and gomati silas for worship. A few months later on 1st January 1937, Srila Bhaktisiddhanta Sarasvati Thakura departed this world while staying at the Gaudiya Matha, Bagh Bazaar temple in Calcutta. News of this tragic event reached Aprakrta Bhakti Saranga Goswami Prabhu in London via telegram. In that far away land Aprakrta Bhakti Saranga Goswami Prabhu endured the shock of separation from his beloved spiritual master and continued to press on the mission of Sri Krishna Caitanya according to the order of his beloved Gurudeva by holding lectures in such places as Caxton Hall, London and meeting such distinguished personalities of British society such as Lord Zetland and others. He met with the King and Queen of England at Buckingham Palace and he attended the World Congress of Faiths at Oxford University as the representative of Gaudiya Vaisnavism, delivering a lecture glorifying the sankirtana of the Holy Name of Lord Krsna. In the days, weeks and months that followed, the preaching continued but the finances ran thin, very thin. Having some connections back in India, Aprakrta Prabhu decided to write the King of Darbhanga province in Bihar requesting the King to send him financial assistance. After waiting for several weeks and receiving no reply the situation became desperate. Money was exhausted as was the food supply and the rent at the boarding house was due. One morning Aprakrta Prabhu went for a morning walk in Kensington Park. While strolling thru the park he noticed a sparkling object in a thicket of ornamental bushes. On closer examination Aprakrta Prabhu found a small Deity of Lord Visnu lying there. Lifting the Deity from the bush he saw that the four arms held the sankha, cakra, gada and padma. 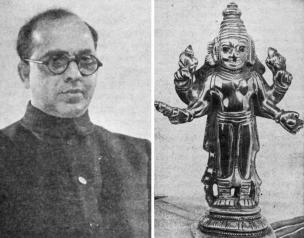 According to sastra, he understood the arrangement of the Lord’s symbols in each of His four hands indicated the Sri Murthy was Adhoksaja Visnu. Astonished at his discovery and feeling blessed, Aprakrta Prabhu returned to the boarding house with the Deity. Upon entry the landlady approached him and said she had found a discarded sealed envelope with his name on it. Opening the envelope Aprakrta Prabhu found an enclosed check from the King of Darbhanga, payable at a London bank for 100 British Pounds! Though the sun seldom shines in London, the sun of the blessings of his worshipable Lord did indeed seem to be shining on Aprakrta Prabhu that day. Going to the bank he produced the check for payment, but when the bank teller asked for identification Aprakrta Prabhu realised that the check was payable to his initiated name and not his secular name as in his official documents of identification. After some discussion the bank teller insisted that Aprakrta Prabhu needed to produce some form of identification. At the point of complete despair Aprakrta Prabhu glanced over the shoulder of the bank teller and there he saw a newspaper opened to the social section and there was the photo of Aprakrta Prabhu along with the announcement that Aprakrta Bhakti Saranga Goswami of India was to be giving a lecture at the local town hall. Aprakrta Prabhu pointed to the newspaper, “Surely this announcement is sufficient identification to prove to you who I am.” Pleasantly surprised the bank teller acknowledged the identity of Aprakrta Prabhu and cash the check. Aprakrta Prabhu returned to his residence and prepared an offering for Adhoksaja Visnu whom had shown His extra ordinary mercy to him on that day, 16th June 1937. Later that year after enduring many hardships and having achieved success in his preaching Aprakrta Prabhu returned to India with the Sri Murthy of Adhoksaja Visnu and was joyfully received by his affectionate Godbrothers and well-wisher on 6th October 1937. In 1942 Aprakrta Prabhu received sannyasa initiation from Srila Sridhara Maharaja becoming Bhakti Saranga Goswami Maharaja and continued his preaching in India until his departure from this world in 1964. Goswami Maharaja opened twenty-two temples and among those are some very important tirthas (holy places) such as Imli-tala in Vrndavana and Acarya Bhavan in Mayapura. Bhakti Saranga Goswami Maharaja was also a near and dear friend of our Guru Maharaja, Srila A.C. Bhaktivedanta Swami Prabhupada. The two preached together on numerous occasions in the 1930s, ‘40s and ‘50s. In 1955, during our Guru Maharaja’s vanaprastha life, Goswami Maharaja requested our Guru Maharaja to stay at his Delhi asrama to write articles for the math’s Bengali publications and to edit the English edition of the Sajjana Tosani magazine. In the great land of Bharata, from distant Kashmir near the high peaks of the Himalayas to the banks of the Indian ocean, who does not know Bhakti Saranga Prabhu? Sri Bhakti Saranga Prabhu is the brightest jewel in the lineage of Sri Nityananda Prabhu. His detachment is the full manifestation of the path preached by Sri Nityananda. Although he adheres to the scripturally ordained duties of a householder, he is a genuine goswami and naturally detached from everything unrelated to Krsna. Every quality-appreciating servitor in Sri Caitanya Matha and the twenty-eight primary mathas of Sri Gaudiya Matha greatly respects him. Every Gaudiya preacher and the numerous supporters of the tridandi preachers from the ocean to the Himalayas throughout the land of the Aryans and the south know of Sri Bhakti Saranga Prabhu’s eloquence and capability in Sanskrit, English, and Bengali. Nearly every single fortunate resident of Gauda has seen, more or less, His holy character, his pure heart’s ecstasy, his earnestness for Krsna, and his profound love for Sri Gaurasundara. With his assiduousness, his constant, all-rounded endeavours from dawn until midnight for the benefit of the society of Gaudiya Vaisnavas, his unparalleled spirit of dedication to Krsna and His devotees, he is fulfilling his name ‘Atula’ [‘unparalleled’]. He has wiped away the moon’s imperfections and replaced them with the immense light from the moon of krsna-prema’s sole path. Thus, by reproaching even the pleasant, shining moon, his position as the unparalleled moon (‘atula-candra’) amongst Gauracandra’s exclusive followers has been realised. He is the teacher (‘upadhyaya’) of worshippable (‘vandya’) Vaisnavas. He is the sole reformer of the rsi’s laws. His heartfelt endeavours are the enlivening energy of Sri Caitanya Math’s Institute for Spiritual Education (Para-vidyapitha). He is a genius amongst the goswamis, and himself is a genuine goswami. The pure devotees have heard that he is renowned to be ‘Bhakti-Saranga’ (‘the embodiment of the essence of devotion’) on account of his expertise and excellence in devotion. Seeing the beauty of the holy lotus feet of this great transcendentalist, the world of pure Vaisnavas is enchanted. He is the secretary of the Sri Visva Vaisnava Raja Sabha. 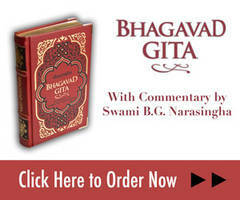 He is one of the editors of Sri Gaudiya Matha’s Srimad Bhagavatam. He is an exemplar in the world of the pure Vaisnavas, a follower of the Sri Rupanuga Vaisnavas, and thus worshippable to the world. In the everyday hustle and bustle of preaching in the west and performing our many duties and services to Krsna and our guru-varga, we often forget, or have never heard of the previous generations of devotees who sacrificed and endured against all odds to spread the glory of the mission of Sri Krsna Caitanya, and who achieved the ultimate grace of the Supreme Lord to become one of His eternal associates. Had they not done their duty and performed their service in the mission of Mahaprabhu, we ourselves would not be where we are today, basking in the rays of the effulgent sun of Lord Caitanya’s sankirtana movement. Let their memory and their achievements never be forgotten. All glories to Lord Caitanya’s devotees past, present and future!